An employee handbook is given to new employees from the employer. 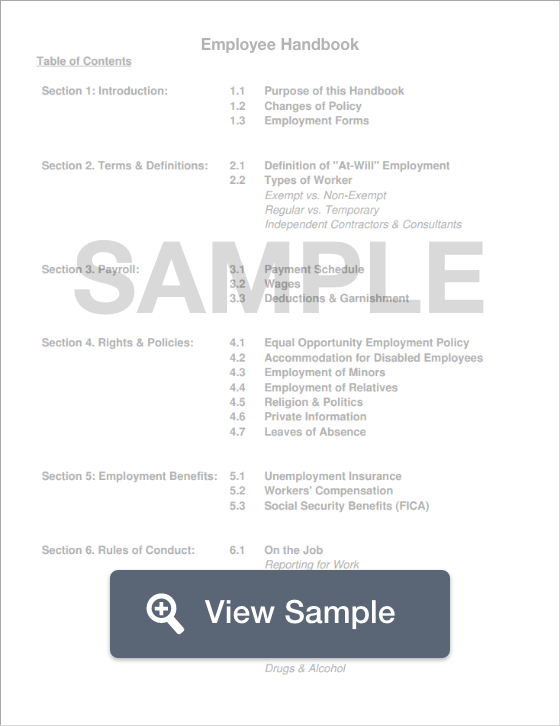 The handbook is used to inform employees about their job duties and expectations set by the employer. An employee handbook or manual is a booklet that provides information and guidance to employees regarding their organization's history, goals, values, practices, policies, and procedures. If created properly, an employee handbook is a valuable resource for both employees and employers that clearly defines the expectations of each party. Employee handbooks may also cover other subjects such as company dress code, compensation policies, the amount of sick time or paid time off available for employees, as well as additional employee benefits. Employee handbooks also help prevent legal disputes between employers and employees. In order to ensure that all employees have received and reviewed the employee handbook, they may be required to sign an acknowledgment form. Moreover, an employee handbook establishes important legal protections for employers and defines the employment relationship. For example, if an employee is fired, the “at will” policy in a well-written handbook should protect the company from legal retribution. Yes, we realize how dramatic "Company Constitution" sounds. However, it’s a fair description. Your employee handbook is your number one resource for dispute resolution, intra-employee mediation, and performance review. Human Resources will use it, employees will (or should) use it, and you will refer to it as needed when revising policy or developing your company’s infrastructure. What kinds of employees do you want working for you? Employees who perform the way you want them to, of course. The employee handbook is a handy definition of what an ideal employee is, how he or she behaves, and what standards your current employees should strive for. Items such as the disclaimer, the non-contract clause (stipulating that receipt of the handbook in no way guarantees employment) and the assumption of your right to change employment policies at-will, grant you the status you need to keep things running smoothly. Other policies, such as the sexual harassment policy, non-discrimination policy, and termination policy, dictate what is and isn't okay, and releases you from liability should unsavory events occur within your staff. It’s true that many employee handbooks read alike. This is because many busy entrepreneurs copy from an employee handbook sample or make lazy work of free employee handbook templates they've downloaded from the internet. Templates and samples can be very useful tools; however, when using them, take the time to customize your employee handbooks tone and provisions to suit your corporate environment. What kind of image does that give your business, anyway? Design your employee handbook keeping your ideal boss-voice in your mind. Do you want to intimidate your employees? Do you want to discipline them right off the bat? Or do you want to project a more casual, congenial image? The tone, as well as the content of your employee handbook, can say a lot about who your company is and what it values. There are a few important distinctions between employee contracts and handbooks. First and foremost, an employment contract is legally binding while an employee handbook is not--although it should outline various company legal policies. Secondly, employee contracts are specific to each individual employee and therefore apply solely to the individual who signs one. An employee contract details the legal rights and obligations of the employee. To that extent, an employee must be consulted if an employer changes the terms of the contract. Employee handbooks, on the other hand, detail guidelines, policies and procedures for all company employees. These include expected behaviors and practices that may not be legally binding (i.e. punctuality). Furthermore, with handbooks, employers can update the handbook as long as their revisions are sent to employees. Who needs an Employee Handbook? Handbooks give companies the opportunity to detail the expectations of all staff members in a standardized way. They also help establish the company’s standards of accountability. Additionally, they provide a platform to share the organization's culture, values, and mission with its employees, and provide a resource for employees regarding their benefits, perks, policies, and so forth. Without a written handbook, employees may be left with an incomplete understanding of their benefits, and may therefore not fully take advantage of all you offer as a company. More seriously, an employee handbook clearly communicates expected workplace behavior and performance. Therefore, if issues arise with employee behavior or performance, a handbook makes it difficult for the employee in question to claim ignorance. Do startups need an employee handbook to cover only a few people? We recommend any organization with more than five employees draft an employee handbook. Creating one in the early stages of the company’s development enables the founders to work out company values and policies at the ground-level and helps ensure that culture imbues future growth. More specifically, creating a handbook allows you to sort out smaller policies, like which expenses you’ll reimburse, while those costs are still marginal. We also recommend that family businesses create an employee handbook, even for family members. Often family operations have difficulty separating business from family. Having a written handbook should help members of a family business avoid difficult disputes over work policies that can affect relationships at home. Here is our guide for crafting an employee handbook. We recommend that just about every company have one. Therefore, in this guide, we cover how to create one, what to include, why you need one, how to roll one out to your employees, and how to keep it up-to-date. We think this guide has everything you need to create a handbook that will serve as a vital asset to both your company and its employees. Create an outline for yourself that details everything you need to include in your handbook (use “what should be included” below as your checklist). Write a summary of each policy and insert these summaries into the appropriate sections of your outline. After you have completed the outline for the body of the employee handbook and have typed up a final draft, review the entire handbook with fresh eyes to make sure you didn’t forget anything or misrepresent anything. If you have a business partner, have them double check the handbook to make sure it is in line with all expectations and values of the company. Bring the finalized employee handbook to a lawyer to review (this is not absolutely necessary, but might be beneficial for you based on your circumstances). Determine how you plan on publishing the manuals and have enough copies printed for all employees. Consider printing a few extra copies for new employees as well as providing a digital copy made available to everyone. Update as necessary (see “Revisions” section for more information on this). Disclaimer/Acknowledgement: This should state that the handbook is not an employment contract. It should also require employees sign the page indicating they have received the handbook and understand they are responsible for understanding, and abiding by its contents. Purpose: A brief section explaining the purpose of the handbook. Company Vision and Mission Statement: This section should succinctly outline what your company does, its goals, its core values, and its mission statement. Employment Policies: These include labor laws (equal employment opportunities, disability, and religious accommodations, etc. ), performance evaluation information, etc. Timekeeping/Payroll: Outline state and federal laws for payment. This should also include company policy regarding attendance, tip reporting, and consequences for breaking the law. Time Off and Vacation Policies: Be sure to include federal and state mandated leaves, holidays, paid vacation, sick leave, medical leave, military leave and how employees should communicate or schedule these leaves with supervisors. Also be sure that your medical leave policies are in tangent with the Medical Leave Act (better known as the Family and Medical Leave Act of 1933). Health, Safety, and Emergency Policies: This includes your company’s policy and procedures regarding work-related injuries or accidents, possession of weapons, OSHA compliance, and how various emergencies should and will be handled. Employee Conduct and Discipline: Detail the specific behavioral expectations of employees as well as the disciplinary procedures and consequences for failing to abide by those expectations. Will your policy use progressive discipline, or will your company operate on a strict zero-tolerance policy? For some issues, such as cell-phone use or habitual tardiness, progressive discipline is generally recommended. However, for more serious offenses, such as sexual harassment or drug use, a zero-tolerance policy is generally the best approach. It not only helps to keep employees accountable but also helps to guard your company against expensive liabilities. Anti-Harassment and Discrimination Policy: What is your company’s stance on harassment and discrimination? What behavior qualifies under these categories? Where should harassment and discrimination be reported? How will it be dealt with? Remember that there are federal and state legal guidelines for these matters. You cannot, in other words, make up your own policy for discrimination and harassment. Therefore, make sure your anti-harassment and discrimination policies are legal and are created in consultation with your attorney. Also be sure to state clearly (in bold) that these policies apply to everyone in the company, from the president to the entry-level positions. Drug testing and substance abuse: If mandatory drug testing is part of your company policy, be sure to clearly explain so and detail how testing will be conducted as well as the consequences for a failed test. This section should also include other policies regarding drugs and alcohol in the workplace and the consequences for violating policy. Separation Policy: Explains voluntary and involuntary termination procedures. This includes the expectations of the employee and employer in the event of a separation. Comprehensive: Let employees know that the employee handbook is not comprehensive. Therefore, if a situation arises that warrants discipline but is not explicitly stated in the employee handbook, you are covered. Regarding discipline: You do not need to detail specific recourse or disciplinary actions. Instead, state that each individual situation will require independent judgment and will, therefore, be handled individually. Identify everyone in the company that has the authority to change “at will” employment. Identify who has the power to change the employee handbook. The handbook should be easy to understand. Use clear, concise language. Has the handbook reviewed by an attorney who understands employment law? Keep the handbook current and updated as new laws passed that affect the workplace. Consider making the handbook mobile and available online, so employees can access it remotely. This may also save you the expense of printing out entire books. What should you do after crafting the employee handbook? Train your management team: Your management team should be trained in all policies outlined in the handbook so they can answer any and all questions from their employees, as well as enforce all policies outlined in the manual. Train your employees: Employees should have a clear understanding of all company policies and have the opportunity to ask clarifying questions before signing the manual’s acknowledgment. Revisit the employee handbook often: Update the handbook as employment laws change, expectations of employees change, and so forth. Think of the handbook as a living document. Changes in technology that affect information and resources in the handbook. These include contacts, email policy, corporate phones, computers, social media postings, etc. This also means that your company needs to remain diligent on staying up-to-date on new laws impacting your work environment. For example, regarding marijuana, some states prohibit employers from firing employees for the use of medical marijuana, but other states allow it, so long as the drug’s use is impairing the employee’s work performance. Employee handbooks are an essential document for all companies and their employees. They create a clear line of communication between employer and employee regarding workplace expectations, corporate values, policies, and procedures. We hope this guide helps you get your own handbook started. Legal considerations are industry and geographically specific. Different industries and states have different laws regarding written documentation of company policies. However, regardless of the industry or location, certain organization policies and procedures must be documented in writing. Those include, for example, anti-harassment policies and internal reporting policies (in California, specifically). See below a few additional resources and examples of employee handbooks. Employee handbooks act as a foundation for your company, laying the groundwork for all operational behavior, policies, and standards in relation to federal and state law. With the help from this article, you can not only create an original employee handbook that uniquely shares the voice of your company, but it also ensures that your employees operate and work in the most efficient way. Our team at FormSwift wanted to determine which states are the best and worst for employee benefits. We created a ranking by evenly weighting the following factors to come up with a final percentage for each state: per capita personal income, average employer contribution for health insurance, number of healthcare tiers available for employees with dependents, state average pension funding for public employees, and percentage of vacation time used by employees in each state. An employee handbook has two main functions. It ensures that your employees know exactly what is expected of them as a member of your team. It can also b e used for training your employees if it also includes a walk-thru of their responsibilities. If you're selling goods or services, you need a receipt template. A receipt template is a document that you can change to suit your needs. This means that your receipt can be personalized to meet the look and feel of your business. Employee evaluation forms are an integral part of business. This form helps business owners provide constructive feedback to employees so that they may continue in their professional growth. An employment contract is a vital document that can be used between a business and an employee. It describes the duties and obligations of each party. It often includes the salary, a specific length of time for the contract, and whether or not the contract may be considered for renewal.